OPBF, is that another way of saying "Japan v Philippines?" 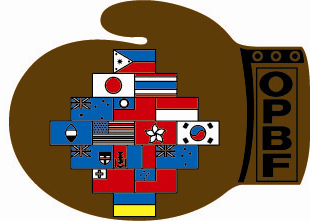 It's impossible to deny the importance of the OPBF title belts in Asian boxing. It is a belt that almost every great Asian boxer has won on their way to becoming successful. It's almost a ritual that you need to do before even dreaming of becoming a boxing legend. Sadly the OPBF title has become less and important over the past few years and whilst it was once "the Asian title" it's now become much more of a "Japan v Philippines" title with very little competition coming from Thailand or South Korea. In the past the OPBF belt was fought for by the best in all of Asia. With boxing taking a down swing in South Korea, Thai's focussing on the PABA belts and China not yet fully running a major boxing operation we're left with just Japan and the Philippines. Whilst the lack of competition for the OPBF belts could have been a reason to complain I view it as a doubled edged sword. Yes their is fewer countries competing and the talent pool has clearly shrunk, though on the flip side we now have a regular rivalry between two Asian boxing super powers. Yes it'd be nice if top Thai's were to join in but having regular "Japan v Philippines" contests does give both countries a reason to really get behind their fighters. Right now their are 7 male OPBF title fights arranged. Of those 7 bouts two are all Japanese contests and one is an all Filipino contest. The first of those will be a Japanese/OPBF Middleweight unification contest as Akio Shibata battles Daisuke Nakagawa in a great domestic bout, just 10 days later we then get another all Japanese OPBF bout as Light Middleweights collide and Koji Numata fights Takehiro Shimokawara. The all Filipino contest sees Ardin Diale fighting Chris Paulino for the vacant Flyweight. After those two bouts we're then left with 4 successive "Japan v Philippines" title fights over the space of just 3 weeks. Amazingly 3 of them take place inside a single week! The best thing though isn't the fact we have so many fights in such a short space of time, instead it's the fact that e have those bouts across a span of weight divisions. The lowest of the fights is at 105lbs, the highest is at 140lbs whilst the other titles are Bantamweight and Featherweight. This gives both countries a chance to put across a few of their best fighters in some of boxing's most competitive divisions. The first of these 4 fights takes place on March 24th when Hisashi Amagasa (25-4-2, 16) defends his OPBF Featherweight title for the first time. Amagasa, a freakishly tall Featherweight, hasn't got an easy assignment ahead of him despite the fact his opponent, Vinvin Rufino (34-15-3, 16), has a less than flattering record. This something the OPBF themselves acknowledge by having Rufino ranked #1. Amagasa won the title last October by beating Ryol Li Lee an avenging a loss from 3 years prior. The loss to Lee was Amagasa's last loss and he is currently on a 10 fight winning streak. Amagasa went from a mediocre 15-4-2 to a wonderful 25-4-2 in his last 10 bouts so he will know himself that records don't tell the full story of a fighter. Rufino has been unfortunate in a lot of his losses. He has often taken fights on late notice, he has often had to travel for fights, going to South Africa, Thailand, Japan and Indonesia and in some cases he has just been flat out robbed. I'm not going to claim Rufino is world class, far from it, but he is significantly better than his record indicates, as proven by his two narrowly losses to Sipho Taliwe and his loss Naoki Matsuda in his only previous OPBF title fight. Whilst I feel Rufino is much better than his record suggests I'd still suggest that Amagasa should win this one. 1-0 Japan I guess. Just a day after the Featherweight title fight we then drop to the Bantamweight division as Ryosuke Iwasa (16-1, 10) defends his OPBF Bantamweight title against Filipino Richard Pumicpic (14-5-2, 4). 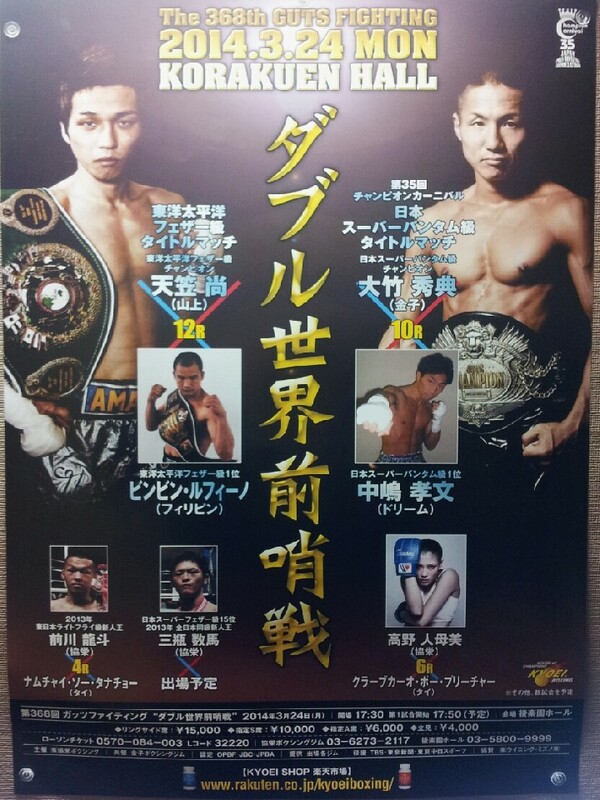 As with Amagasa's fight this will be Iwasa's first title defense and he'll be fighting the #1 contender. Iwasa is a fighter I've been keeping a close eye on and have been a big fan of since early in his career. His talent is obvious and as well as currently holding the OPBF title he has also won the Japanese belt and is the WBC #1 ranked contender. With power, talented, speed and skill "Eagle Eye" is a man I have been tipping for a world title and feel that this will be his next step to one. Unfortunately I rather like Pumicpic who, like Rufino, has a marked up record though is significantly better than the raw numbers would indicate. In fact from his 5 losses 3 of them have been majority or split decision with the other two have been very competitive decision. As well as his losses he has also been unfortunate in his draws including a majority draw with Japan's very own Yohei Tobe. He's tough, he's rough and he's a handful for most fighters in and around Super Flyweight and Bantamweight. The third of the "Japan v Philippines" bouts sees the unbeaten Ryuji Hara (16-0, 10) fighting against Donny Mabao (21-20-1, 4) for the vacant OPBF Minimumweight title. This bout, on March 30th, looks like a complete mismatch on paper with an unbeaten fighter taking on an opponent who has won just 50% of their bouts, though we genuinely expect it to be amongst the most competitive match ups. Hara, a former Japanese champion, is taking his first step up to the OPBF level and will be trying to claim his second title. Unfortunately however I am doubtful over just how good Hara actually is and in his 4 Japanese title fights he really struggled. He is unbeaten but with slightly different judging he could easily have lost some of those bouts. Mabao, like the other two Filipino's already mentioned, has a very misleading record. Looking at his record you'd assume he's a poor journeyman who only beats the odd novice. The truth however is that he's been in with some very good fighters and has one or two notable victories as well as some very debatable losses. The most notable victories on his record have come against Florante Condes, in his last bout, an Mateo Handig a few fights earlier, whilst he has suffered close losses to Ronald Castrodes, Kwanthai Sithmorseng, Ryan Bito and Merlito Sabillo. Hara has to go in to this bout as the favourite based on just his record but I'm liking the upset and if it Mabao does manage to get it we'd then get the score to 2-1. The final OPBF be to be currently scheduled is on April 14th an is by far the most well matched. The contest, for the Light Welterweight title sees the unbeaten Adones Cabalquinto (15-0, 8) taking on the once beaten Keita Obara (10-1, 9). For the first time it's the Filipino fighter with the better record and it's Cabalquinto, pictured, who will be risking an unbeaten record. Unfortunately that does tell us quite a bit about Cabalquinto who is fighting in a weight division which lacks real talent on the domestic stage. He has been a former Filipino champion though his competition has been weak. He's still very capable, talented and promising but there are a lot of question marks surrounding his true potential. With a loss to his name Obara's record is marked but his record also shows his impressive KO power stopping 9 of his 11 opponents. More impressively 8 of those KO's have come successive fights with victories coming against Kazuya Maruki, Hayato Hokazono and So Takenaka. Those results for Obara came after he suffered a debut defeat at the hands of the very experienced Kazuyoshi Kumano, a defeat that although bad on paper seemed to allow Obara to learn a lot. This bout is easily the most well matched contest amongst the 4 "Japan v Philippines" though unfortunately it's another one where I'll be siding with the Japanese fighter who I suspect will end the series of fights with a 3-1 lead to Japan.